Cornmeal Raspberry Muffins made with raspberries from my garden definitely say summer to me. These muffins are simply a variation of my basic gluten free cornbread recipe. I love to vary a reliable recipe and make it year round in different ways. You don’t need a huge repertoire of recipes to be able to cook and bake great food. A short list of basic recipes that can be varied according to your taste and the season is the secret. In the summer when raspberries are hanging off the bushes in my backyard you can be guaranteed I will make these Cornmeal Raspberry Muffins. The basic recipe for cornbread can be served straight out of the pan smothered with corn syrup any time of year. For Thanksgiving and Christmas I use the basic recipe to make Cornbread-Chorizo Stuffing. In the winter I make the same recipe and add cheddar cheese, chopped cooked bacon or jalapeno jelly. I like some version of Cheddar Cornbread with homemade chili or a hearty soup. Canada turned 150 years old in 2017. The celebrations lasted all year and Alberta Food Tours celebrated with an Instagram contest highlighting food photos taken by passionate Alberta food lovers. Thousands of people posted photos using the hashtag #EatAlberta150 all month long and daily winners were chosen. 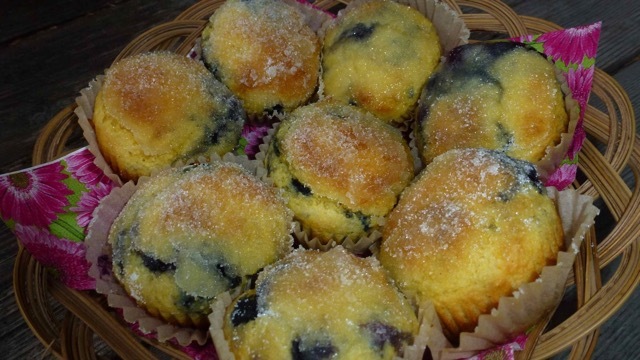 Shout out to @AlbertaFoodTours for choosing our photo of Cornmeal Raspberry Muffins as a daily winner. So back to the idea of a basic recipe. Once you have a recipe you like I suggest you make it a few times. This confirms that you know it works in your kitchen every time. Create a system so you can find that recipe when you want to make it. Make a few notes like the pan you used, the cooking time and if there is something you want to tweak next time you make it. To make these muffins from the cornbread recipe I increased the sugar, added lemon zest and fresh raspberries. I also decreased the baking time since muffins cook more quickly than a whole cake. I thought those were enough adjustments from the original cornbread to post this muffin recipe on its’ own. For a special occasion dip the top of each muffin in melted butter then roll in sugar. The butter adds richness to the taste and the sugar creates a special occasion look. I put them in a basket with a colourful napkin and share them with friends. In the comments below let me know if you tried recipe or changed it in some way. Preheat oven to 400°F. Put paper liners in a muffin tin. Combine wet ingredients in a mixing bowl. Beat with electric mixer until frothy, about 1 minute. Slowly spoon in dry ingredients. When combined increase speed to high and mix for 1 minute. Using an ice cream scoop portion batter into prepared muffin pan. Bake 20-25 minutes until toothpick inserted in the middle of the cornbread comes out clean. Let cool slightly before serving. TIP – Raspberries are very fragile. Frozen raspberries hold together better when folded into the cornbread. FINISHING - dip the top of each muffin into melted butter then in white sugar for a nice look and a sweeter finish.